It could be quite difficult to write my book thoughts on ‘Shades of Grey’ by Jasper Fforde. I should instantly clear up the fact that this is not because it’s a difficult book to read, it’s just got such a huge scope. I hadn’t read any Jasper Fforde before I read this novel (although I have wanted too for ages and tried to have ‘The Eyre Affair’ as a choice for an old book group) and so in some ways I didn’t really know what to expect. I did get a whole lot of something that I wasn’t expecting. In Shades of Grey we meet Eddie Russett who is stuck inside a carnivorous plant that a girl he shouldn’t have fallen in love with, because she is a Grey, has pushed him in. As he contemplates a highly likely death he tells us of the story of how he got there from leaving his home and his “possibly” fiancée Constance and heading away with his father to the Outer Fringes and East Carmine in a dystopian future where people are put in a social order by the colours that they can see, the Russett’s being Reds. However things start to go very strange when Eddie’s father saves a Grey who has disguised himself as a purple and another Grey, Jane, suddenly turns up in his life bringing along a whole heap of adventure that takes us through an amazing landscape and a host of unusual characters and creatures. That sums up the start of the story but there is so much more to the book than just a great premise. The book is utterly compelling; it’s also bizarre in a brilliant way. It was some of these bizarre things such as the fact that people go to the Emerald City to reboot (too long to explain) that both made me more interested and slightly concerned at the beginning that maybe this wasn’t going to be for me. I was also slightly worried that this was going to just be a rewriting of Nineteen Eighty-Four, but then won’t that happen to any dystopian book initially. Fortunately I soon realised this was nothing like Nineteen Eighty-Four, not because it isn’t as good but because you simply cannot compare the two other than they are both set in a future. Have I mentioned that the book is very, very funny? I wasn’t expecting to laugh out loud and I did quite a lot which only added to my enjoyment. I was happily lost in Jasper Fforde’s world and didn’t want to leave; I am very much looking forward to going back there when the next in the series comes out. I am still left feeling like I haven’t explained the book enough, but it’s a tough job. As I mentioned this doesn’t mean it’s a tough book and the fact that I was hooked reading it through a bout of lurgy shows that. It was a wonderful and very witty escapist read. It has also left me wanting to read lots more of Jasper Fforde’s work which has been described by Books On The Nightstand (who I might be quoting non stop for while) as ‘literary science fiction’ and sums up Shades of Grey, though if you aren’t a fan of science fiction still give this wonderful book a whirl. So who else has had a read of this or who really wants to? What other books by Jasper Fforde have you read and would recommend? Finally, which Fforde should I try next the Tuesday Next or the Nursery Crimes series? So it’s already Saturday once more and I thought I would do another Simon’s Bookish Bits (thanks for all your votes and comments last week) featuring all things bookish that has caught my eye this week. I have to admit I haven’t really been whizzing around the blogs too much over the last week and I blame Gran for that completely, ha, that will get me in trouble. I have created a new blog though! After having a chat with Kimbofo, who I founded a book group with, we decided that a separate site for The Riverside Readers would be good (my page is looking a bit barer now) and you can pop here and check it out, do feel free to leave feedback over there. I think its nice giving it its own space as it’s out there for everyone in its own right rather than a page on Savidge Reads. What I have seen on the blogs that have caught my eye are delights such as the link which Thomas at My Porch put up so you can create your own blue plaque and waste a good few hours, lovely! I also thoroughly enjoyed Simon Stuck-in-a-Book’s post on children’s books which I will be doing my own special post about on Tuesday. That doesn’t seem much to report but I do have some serious blog reading catching up today. 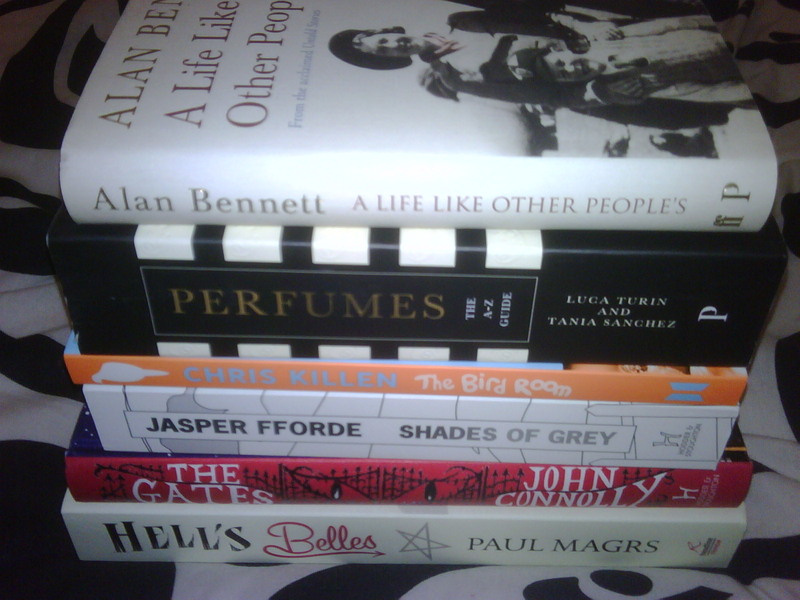 I have once more managed to go to a book shop and spend absolutely no money at all. 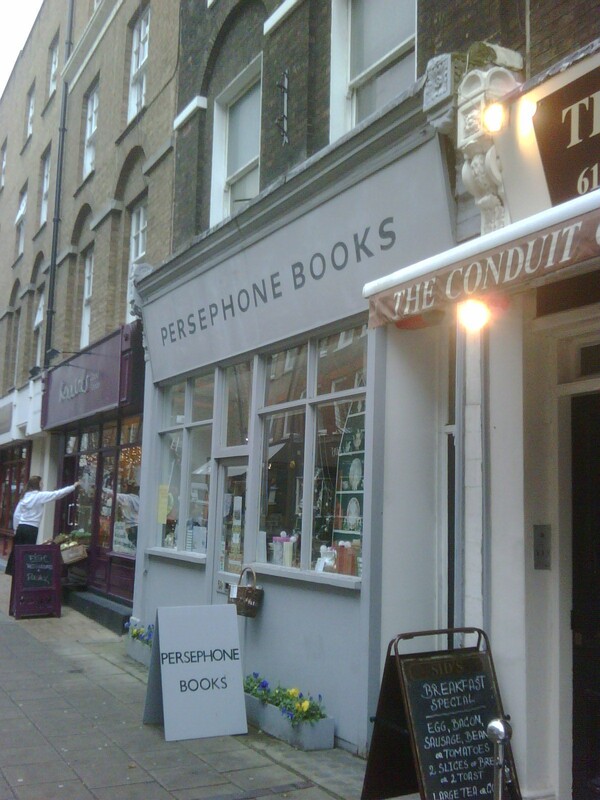 This week it was quite worrying and also shameful as it was at Persephone Books on Lambs Conduit Street. 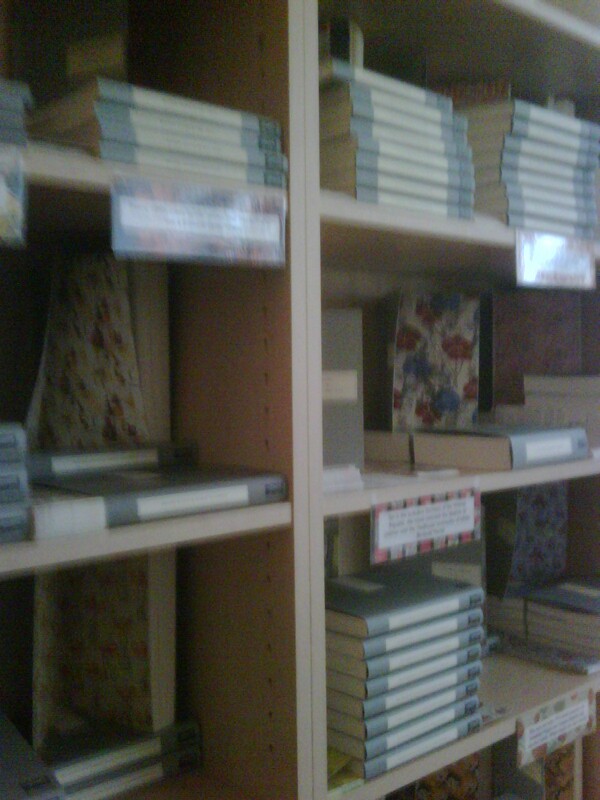 I think I was overwhelmed by all the titles and just being there. I wish I had known of this shop when I worked on Gray’s Inn Road even though it would have meant I would never have had any money. I did manage to get a couple of pics though I didn’t introduce myself as they seemed to be in the middle of a huge mail out or something exciting. Gran loved it; she is now an official Persephone convert. Podcast of the week has to be The Dog Who Came in from the Cold which is the serialised sequel to Corduroy Mansions by Alexander McCall Smith. I save them for a binge of six in one long listen over the weekend. There’s only ten episodes to go so if you want to download the series you don’t have long left, you can pop here and it’s easy as pie. Finally, though I have still not bought a book since November (which I will have to break for the next book group choice) somehow several have arrived in the post from lovely publishers. 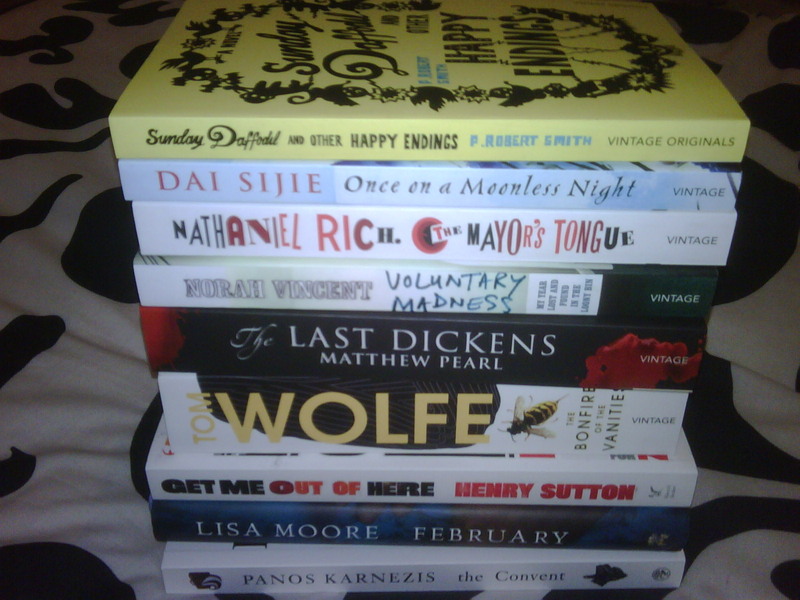 Parcels from Profile, Canongate, Hodder and Headline brought some joys. Have you read any of these books or authors? What has been going on for you that’s bookish this week?